Thousands of people have taken part in a series of protests in Moldova’s capital, Chisinau, with protesters demanding the government’s resignation and early elections over a $1 billion bank fraud case. Daniel Brett, Ellie Knott and Mihai Popșoi outline why the protests are taking place, who the protesters are, and the likely impact on Moldovan politics. They write that while early elections may be the only option to reset the country’s politics, there are no certainties over what the long-term consequences will be for Moldova moving forward. 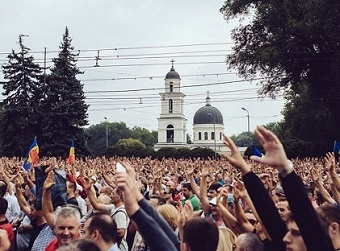 On 6 September Moldova’s capital, Chisinau, saw the largest civic protests since independence. These protests, where up to 100,000 people took to the streets, were larger than the 2009 protests that brought about the ‘Twitter Revolution’ and the fall of the Voronin government. The protests in the symbolically important Piața Marii Adunări Naționale (referred to using the Twitter hashtag #pman), the historical site of protest in Moldova, are the result of growing dissatisfaction among the electorate since the revelation in November 2014 of the “heist of the century” with the disappearance of $1 billion (around a seventh of Moldova’s GDP) through the country’s three main banks. Since the theft came to light, the tripartite pro-European coalition that governs Moldova, holding on marginally through parliamentary elections in 2014, has collapsed and reformed, while also failing to adequately hold those responsible for the banking heist to account. This is likely because they themselves are implicated, if not complicit, in allowing a theft of this size to occur under their watch and have no interest in formally admitting responsibility. For a country of three million residents, this is a large and significant protest movement which, building on previous Sunday protests since May (numbering 10,000-50,000 protesters), may signify a turning point in Moldova’s political history. However this depends on how far the organisers can capitalise on the momentum of protest, whether protesters can exert enough pressure to instigate dramatic changes such as early elections, and whether they decide to shift from a civic movement to a movement seeking political representation. Since the November’s 2014 elections, Moldova’s politics has been rocked by the inability to form governments and the selection of weak candidates, first Chiril Gaburici who then in June 2015 resigned, and now Valeriu Streleț, a well-known millionaire. Moldova’s pro-European coalition vetoed stronger, more pro-reform candidates, in particular Maia Sandu, who wanted a fuller investigation of the banking fraud, including the removal of the head of Moldova’s National Bank. She wanted to be able to sanction public institutions, arguing that the scale of public spending cuts had to be supplemented by evidence of greater political sacrifice and accountability. This has taken place against a backdrop of price rises for electricity (37 per cent), gas (15 per cent), and bread (15 per cent) where the average wage remains only around 4,500 lei per month (€216/£153/$240). However, pro-European leaders such as Mihai Ghimpu, head of the minority Liberal Party (PL) within the coalition, rejected Sandu because ‘she would have to come to him, he would not go to her’, reflecting the self-serving arrogance of many of Moldova’s political elite who put their own interests first. Even before the banking crisis, popular trust in the three parties within the governing coalition – the Liberals (PL), Liberal Democrats (PLDM) and Democrats (PDM) – was faltering, in particular after the May 2013 crisis between two of Moldova’s political “godfathers” (and oligarchs) Vlad Filat (PLDM and then Prime Minister) and Vlad Plahotniuc (PDM). The pro-European coalition took power in 2009, after the fall of the authoritarian and weakly democratic Voronin government. With the fall of Voronin and his Party of Communists (PCRM), there was hope that Moldova might change direction, both geopolitically towards Europe and the EU and politically, by instituting political and economic reforms of transparency, accountability and political responsibility. Hence, this protest movement is the culmination of six years of dissatisfaction at elite corruption and arrogance, and now mounting economic shocks, with the banking crisis the final symbol of the current regime’s unwillingness to instigate reforms and clean up politics. However it is important to also emphasise what the protests are not about: namely ethnic politics and geopolitics, typically framed as the dividing cleavages of Moldova’s state and society. The claims of the protesters are solidly political (elite turnover, early elections, investigation of the banking scandal) and the numbers protesting far outnumber other protest movements, such as pro-Romanian/unification protests that are miniscule (a few thousand) by comparison. 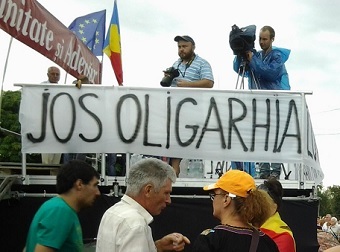 Rather, protesters, echoing the appeals of Ukraine’s EuroMaidan “revolution of dignity”, want Moldova to be run differently, hence there has been a marginalisation of pro-unification factions, while their slogans for the movement are ‘city of dignity’ and ‘Moldova without thieves’ (Moldova fără hoți). While the pro-Russian Socialist Party (PSRM) supports the protests, their banners are not welcomed on #pman. The PSRM’s leader, Igor Dodon, seems to be sitting on the sidelines, waiting to put some extra pressure should the time come to trigger early elections, if it comes to that. By contrast the Communists, with their waning electoral support, are less forthcoming in their support of the protests and early elections, even if they agree in principle in their dissatisfaction with Moldova’s current direction. Who is organising the protests? Aside from the issues motivating the protesters, which come from below, there is a clear organisational force mobilising the protests: the Civic Platform for Dignity and Truth (PCDA). This was established in February 2015 by a group of civil society representatives, mainly associated with the JurnalTV television station, a station established after the 2009 protests. One of the founding members of the Platformdescribed how the protest movement came about from discussing Moldova’s troubles in the country on air at JurnalTV and especially during advertising breaks. Lawyer Andrei Nastase is viewed as the unofficial leader of the Platform, while Igor Botan, political analyst and director of ADEPT, is its brain trust. Nastase is also the lawyer of businessmen Victor and Viorel Topa, alleged owners of JurnalTV, who themselves have been implicated in conflicts with Plahotniuc, have been convicted for embezzlement, and in 2010 escaped to Germany. Unsurprisingly, despite generous international media attention, and internet attention within Moldova, the protests enjoy minimal coverage on Moldovan TV, as the main source of news for ordinary Moldovans. Plahotniuc owns the largest media holding in the country and has considerable sway over the public television network. This minimal coverage by Plahotniuc-owned TV has focused on discrediting the PCDA, focusing on its untransparent business relations and the presence of pro-unification activists within the movement. Thanks to JurnalTV, social media and word of mouth, the 6 September protest rivalled some of the largest political rallies of the past few years, which themselves have required tremendous administrative resources to boost their turnout. By comparison, the PCDA have relied mostly on genuine civic activism. In fact, protesters are so determined that about 100 tents remain overnight throughout the week in #pman. The protesters are drawn from a wide range of citizens and, unlike in 2009, the protesters are older and from across the country, although most come from Chisinau and the surrounding area. The protesters represent a large cross-section of society, demonstrating it to be a mass movement rather than just disaffected intellectuals. Those in the ‘city of dignity’ are mostly middle aged men and, significantly, Nastase was criticised for sexism after calling for ‘strong men’ to stay at the site. Thus, while the movement has been orchestrated by the PCDA, there is a story too of a genuine grassroots movement, sustained by those camping, donations of food, money and even refrigerators. The success of the movement is that, in light of the stolen billion, worsening economic conditions and a lack of willingness among the political class to change, many people are enraged and have found a voice in the platform, being drawn to the streets and coming to believe that change is possible, if not imminent. Despite large numbers and the best efforts by organisers to curb open displays of pro-Romanian nationalism and welcome ethnic minorities into the protest, Russian speakers remain overwhelmingly underrepresented. This could be explained by the existence of a powerful opposition, represented mainly by Igor Dodon’s Socialists and Renato Usatii’s ‘Our Party’, both of which happen to be pro-Russian. Thus, the protest movement remains largely centre-right, pro-European and pro-western. This limits its mobilisation capacity, appealing largely to the existing electorate of the pro-European parties. It also creates fertile ground for conflict rather than cooperation with the left. Indeed, both Dodon and Usatii announced plans for anti-government rallies of their own, hoping to trigger early elections, which they are best positioned to benefit most from. Initially, the PCDA appeared to want to remain a civic and “informal organisation”, as argued by Boţan, to maintain its anti-corruption policies. It seemed also to achieve relatively little in terms of the willingness of Moldova’s governing regime to relent to its demands. In fact, Moldova’s Prime Minister, Valeriu Strelet, argued that the political instability caused by the protests could weaken the economy further and jeopardise talks with the IMF, scheduled for 22 September, which might provide a much-needed financial lifeline. Indeed the government also made awkward moves to undermine the protests by temporarily suspending price hikes of gas, electricity and bread. However, inspired by the daily return of people to #pman, notably on Sunday 13 September, the PCDA have signalled their willingness to transform into a political movement and form a shadow government. Yet the faces of key actors that might help such a transformation remain hidden, most notably the highly popular Maia Sandu, whose opportunity to become Moldova’s Prime Minister was vetoed by the minority coalition partners back in July 2015. She has voiced support for the PCDA, joining its Council. Should she become more visible within the movement, then the PCDA could become much more politically significant. Early elections may be the only option to reset how Moldova is governed. However there are neither guarantees that the discredited current elite would return nor that the pro-Russian Socialist opposition could reap the benefits of a protest movement that appeals only to pro-European voters. The PCDA are choosing to ignore these risks and, by signalling they may be willing to establish a political arm, they have demonstrated that they may be serious in their aim to hold the current pro-European elite to account by taking the protests from the street into the political arena. The concern therefore is how far the movement can crystallise its political arm. Assuming it is established, how it emerges will prove critical, and whether it is joined by reformers like Sandu. This will reveal also whether it is a genuine outpost of public discontent, that wants to change the way Moldovan politics is run, or whether it is a carefully orchestrated proxy war among Moldova’s two godfathers – Filat and Plahotniuc. If it is the latter, this is a path, potentially, towards mutually assured destruction and continued political instability. The protests also challenge the idea that Moldovan politics is dominated by the ‘east vs. west’ debate, demonstrating yet again that issues of domestic politics, in particular corruption reform, should be Moldova’s most fundamental policy objectives. This is important not only to win international funding from agencies that are hesitant to invest “through the front door while there is a risk of even larger sums of public money being lost out of the back door”, but also to eek back the faith, and lost hope, of Moldovan society in politics and the (lack of) investment of Moldova’s elite in the future of the country. Note: This article is a product of my collaboration with Daniel Brett from Open University and Ellie Knott from London School of Economics. The original article can be found here: EUROPP. This entry was posted in AIE 3, Alliance for a European Moldova, Corruption, democracy, Elections, Moldova, Political Protest, Regulatory capture, State capture and tagged Andrei Nastase, Cityofdignity, Igor Botan, Platforma Demnitate și Adevăr DA, PMAN, Protest 6 Septembrie 2015, Truth and Dignity Platform. Bookmark the permalink. AlexandruF, I agree that things have being going down the drain in Moldova for as long as I can remember. I also agree that things in Europe are not very encouraging either, but I still contend that there is no alternative to EU integration in a normative sense. Both in terms of values and, even more so, in economic opportunities EU is net superior to the Eurasian Union. The low support for EU integration is a result of several developments that reinforced each other. 1. Moldovan governments discredited EU integration by being corrupt. 2. European Union has been facing economic turmoil. 3. Russian media has continuously exaggerated all that is bad about EU and glorified Russia. Just like in “good old” soviet days. The fact that Moldova is exporting its labor force to EU is more of a blessing than a curse. Many countries have gone through a similar phase. It is just a matter of wise public policy and time and things will improve, provided that Moldova gets a more responsible ruling class, which is not a given, I will give you that. Maybe, for Moldovan elites “there is really no feasible alternative to Moldova’s EU integration”. But a different situation arises with ordinary Moldovan people. Since 2001 Moldova remains the poorest country in Europe. 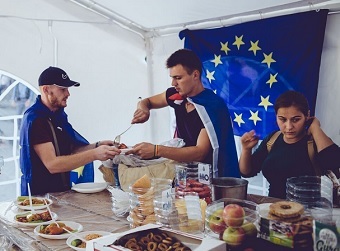 As early as 2009 over 600,000 Moldovans left the country to find work in the EU. Ever since their numbers have increased greatly, especially after Moldova signed Association Agreement with the EU in June 2014. This has really been made easier since the EU lifted its visa restrictions for Moldovans! But today the visa does not ope up them opportunities to find work in the EU at all as the present mass flow of refugees from the Middle East countries has already led to active driving Moldovans out of the EU business. And it has had extremely negative consequences for financial standing of not only Moldovans, lived in European countries, but also those of their relatives, who continue to live in Moldova now. As a result, today their support of Moldova’s euro-integration policy has fallen to 30%, in contrast to the 50% of those who support the Russian-led Eurasian orientation line. So that is the real alternative for half Moldovan population just now. I beg to differ. The disillusionment is indeed growing. but it is only a result of the corrupt government pretending to engage in ‘development’ by the means of European integration. The problem is not with the Western vector per se, but the way Moldovan elites are carrying it out. There is really no feasible alternative to Moldova’s EU integration. And it is high time for Moldovans to “try building a brand of their own” as today it becomes more and more obvious that continuation of Western vector’s development of this country can lead only to further unpunished plunder of the Moldovan population and the country’s economy destruction. The disillusionment is really growing in Moldova with the pro-Western course its government is taking. Well, ‘Ukrainian Maidan’ is a buzzword nowadays – a political brand even, a bloody one too. Whereas, Moldovans are trying to build a brand of their own, hopefully with no blood.